Despite his passion for the world of regattas being something recent, in 2011 Alessandro Rombelli graduated Melges 20 World Champion in Miami, where on board Stig, he sailed together with Jonathan McKee and Giorgio Tortarolo, and during the 2012 summer he launched, and conducted in the role of owner-driver, a Baltic 72 drawn from Judel-Vrolijk with which he competes in the Mini Maxi class. The name of this boat is Stig. Team Manager and creator of the project is Enrico Zennaro, a young sailor who, after the experience with Emirates Team New Zealand during the AC World Series Venice as local expert, decided to ride the wave of the America’s Cup, creating, thanks to the introduction of Red Bull youth America’s Cup, a unique opportunity for young talents and for Italian sailing. The America’s Cup, the best young sailors in the world sailing stage, the help of Luna Rossa who provides his Extreme 40 for training, a group of sponsors who believe in young people, a successful sailor owner, an exceptional coach, a cohesive and enthusiastic team: these are the ingredients of the team Italy powered by Stig project. Enrico has already worked as team manager for winning boats, considering this an increasingly important role for his profession, Team Italy powered by Stig has until now certainly the most ambitious project for him. In his career, Enrico, born in Chioggia January 6, 1980, has won 7 world championships, three european Championships, one mediterranean championship, 8 Italian championships. In addition, he boasts successes in the Barcolana, Key West Race Week, Swan Cup, Tour of Italy, Palermo-Montecarlo ORC, Copa del Rey and Veleziana. Lorenzo Mazza, involved in the project Team-Italy powered by Stig as a coach, is the Italian sailor with more experience in the America’s Cup: he is one of its protagonists since the challenge of Azzurra, dated 1983. In 1992, with Il Moro di Venezia he won the Louis Vuitton Cup. He repeated that success in 2000 with Luna Rossa. After the 2003 edition, also played with the team of Patrizio Bertelli, Mazza passes under the banner of Alinghi, which won the America’s Cup in 2007surpassing in a hard fought final Emirates Team New Zealand. The latest campaign was in 2010, won in Valencia on board the maxi multihulls. Lorenzo Mazza won many international and prestige regattas like the One TonCup (Brava Q8), the Admiral’s Cup (Brava Q8), the Sardinia Cup, theWorld ILC40, the circuit Extreme40 (Alinghi), to Centomiglia (Griffin) and TP52 Super Series(Quantum). The meteorological support of Team Italy powered by Stig was supported by the famous sailor Francesco Mongelli. In addition to being a popular expert in meteorology, Francesco is a great navigator who designed and developed the electronic systems of many racing boats and created some navigation software. In his palmares: 9 world championship, one european title and five Italian titles. The passion for the sea and the increasingly large demand for sailing events form the strength of this company. A young and dynamic team that wants to achieve for you and with you great events 360 ° oriented on sailing world and that knows how to respond and adapt to specific needs, developping each project with professionalism and competence. A society that loves difficult and ambitious goals, that always works with passion on new ideas. Communications manager of Team-Italy powered by Stig is Zerogradinord: Mauro Melandri, founder of Zerogradinord, has been working as a sports journalist since 2002, when he started a collaboration with the monthly SoloVela. Sports manager from 2005 to 2010, he followed closely the main Italian and international sailing events, documenting them through the lens of his camera and his videocamera. In 2008 hedevised Zerogradinord, the website dedicated to the world of competitive sailing, now considered among the most influential internationally. The visibility obtained with Zerogradinord permit to him to manage the communication of important reality of competitive sailing team (DSK Sailing Team, AFX Capital Racing Team and the Enfant Terrible Sailing Team), and manage media relations for Audi Sailing Series circuits and was press secretary of the Melges 24 world championship in 2012. In 2010 he became the official voice of the Louis Vuitton Trophy, commenting live all races sailed in Auckland, La Maddalena and Dubai. In the same year he commented live stage of the Extreme Sailing Series in Trapani. In 2011 he joined the team average of the 34th America’s Series. 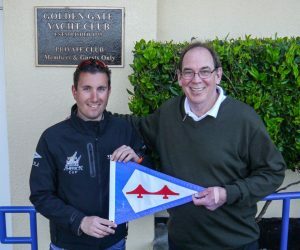 During the Italian America’s Cup World Series event, he was spokesman for the America’s Cup Event Authority and has been the official commentator of races sailed in Venice.